I don't remember the program. I don't remember the date. I do remember that it was some late night Friday music program in the very early 1980's. That's the first time I saw Huey Lewis and the News. I'd heard the single Do You Believe in Love on the radio and liked it. But on this program they played Workin' For A Livin'. Huey absolutely jammed on the harmonica and I've been a fan every since. And so I bring you Huey Lewis and the News for Set 18. If you'd like to join us in the musical fun, the guidelines are basic and simple. 2a. Don't feel restricted by the tracks listed on Playlist.com. And don't be discouraged if the Embed code won't work. You're welcome to use any type of media to share your Sets. 3. Be sure to sign Mr Linky so everyone can visit your Set. My favorite Huey Lewis & the News tunes are I Want a New Drug and Hip to Be Square. They totally transport me back to high school, Trav! I always liked Huey Lewis & the News. They were very commercial, but I liked them. Ah, Huey Lewis & The News - great choice, Travis! Takes me right back to Stockton, California in late 1984/1985 when I was just starting out in police dispatching and it was just myself and my son. It was tough at times but mostly good times! I still own two Huey Lewis CDs - perhaps I need to break them out this weekend? Trav, Hughey Lewis and the News! Love them! Thanks for sharing them! Oooh. The Heart of Rock and Roll is one of my favorites. Wonderful group. Travis,Great set.I hope you like mine. 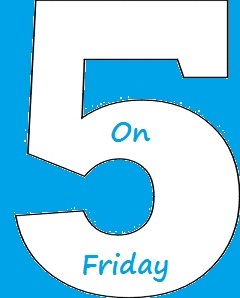 Next week the 5 on Fridayt will be on streoids.it will be great I promise. I really loved Huey Lewis and the News! I haven't thought about them in ages. Thanks for pleasant memories (and really good tuneage).